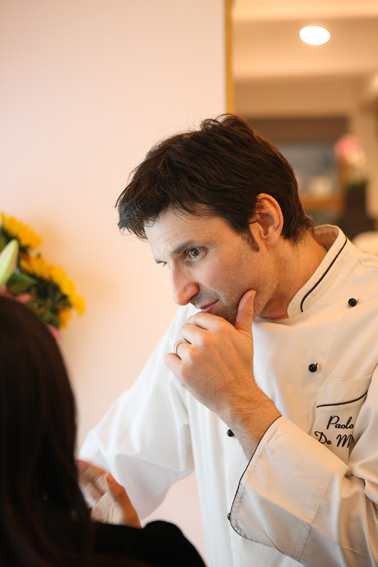 Paolo De Maria is a Chef de Cuisine with international experience. He worked in France and for a number of years in Italy, before deciding on a new venture in South Korea. He is presently employed in Seoul as a chef, consultant and school teacher and he’s also Owner Chef of paolodemaria Fine Trattoria, a nice and cozy restaurant, trattoria and pizzeria in Seoraemaul in Seoul. He has recorded several television episodes of Buongiorno Chef, for the Korean Food Channel and has cooperated with Arirang TV where he was recognized as the most widely known Italian Chef in Korea. In 2008 he has written a cookbook about pasta called Pasta e Basta and it was best seller cookbook for two years and is still used in various Korean cooking schools. He’s also the Korea Representative Chef of I.F.S.E., the Italian Food Style Education, a top class cooking school in Piobesi Torinese in Italy, not only a school but a philosophy of the new trend of italian food business. In 2010 he achieved the Honorary Citizenship from the Major of Seoul for professional and didactic merits.